I’m always on the lookout for interesting ethnic markets. 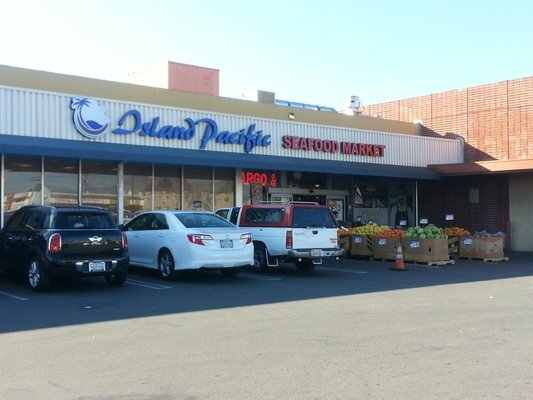 And so, while driving several days a week to a deep western corner of the San Fernando Valley to visit my father recovering from cranial surgery, was delighted to discover the Island Pacific Supermarket. My repertoire of markets boasts a healthy array of ethnicities — Japanese, Chinese, Indonesian, German, Italian, Persian, Mexican… But here was something new — a Filipino market! Island Pacific had much in common with other Asian markets I frequent — rows of fermented fish and bean sauces, weird chips flavored with things like squid and tamarind and odd cuts of meat you don’t see in the regular market. Presenting themselves as a “seafood market” on the sign out front, they had an impressive selection of fish. There were tanks with live catfish, Dungeness crabs and lobsters, and a big long iced table with twenty five or thirty different whole fish (including some red mullets I purchased and put in a giant paella I cooked for a party recently). Cephalopods were well represented with piles of squid and three different sizes of octopus. Among the things that differentiated Island Pacific as a Filipino market were big bags of lumpia in the frozen section, freshly made pancit noodles and a wide variety of longaniza sausages. One day I will research Filipino food and buy a bunch of stuff to make a big Filipino dinner. 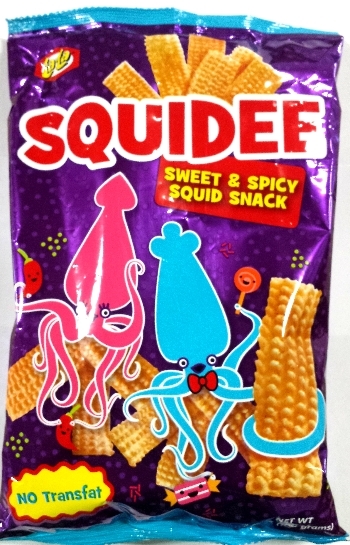 I wasn’t quite ready for that, though, so in addition to the mullets I grabbed my wife some Squidee sweet & spicy squid chips and got a few spices. Browsing the strange leaves and tubers in the produce aisle, I stumbled upon green papaya. I love the green papaya salads of Thailand and Vietnam, and had made a wonderful version once myself with some pre-shredded papaya I’d purchased at a grocery store in Little Saigon. But I had never dealt with a whole green papaya. It was my time. Back at home, I attacked the papaya with a potato peeler, then used a nifty little Kuhn Rikon serrated peeler/shredder to created superfine strips as good as any mandoline could’ve. I pan fried some tofu, mixed together a quick Thai-etnamese-style garlic/fish sauce/lime dressing, tossed it with peanuts, basil and tomatoes and was in business. The Squidee chips didn’t go over so well — I think the chickens got most of them. But the green papaya salad was a hit! 1 cube tofu, about 15 oz. Slice your block of tofu in half, and then cut the halves into strips about 1/4 inch thick. Heat the oil in a non stick pan over medium high heat, and fry the tofu about 3-4 minutes on each side, until golden. Remove to a paper towel to cool. Make your dressing: mix together the fish sauce, lime juice, garlic, sugar and olive oil, stirring until the sugar is dissolved. 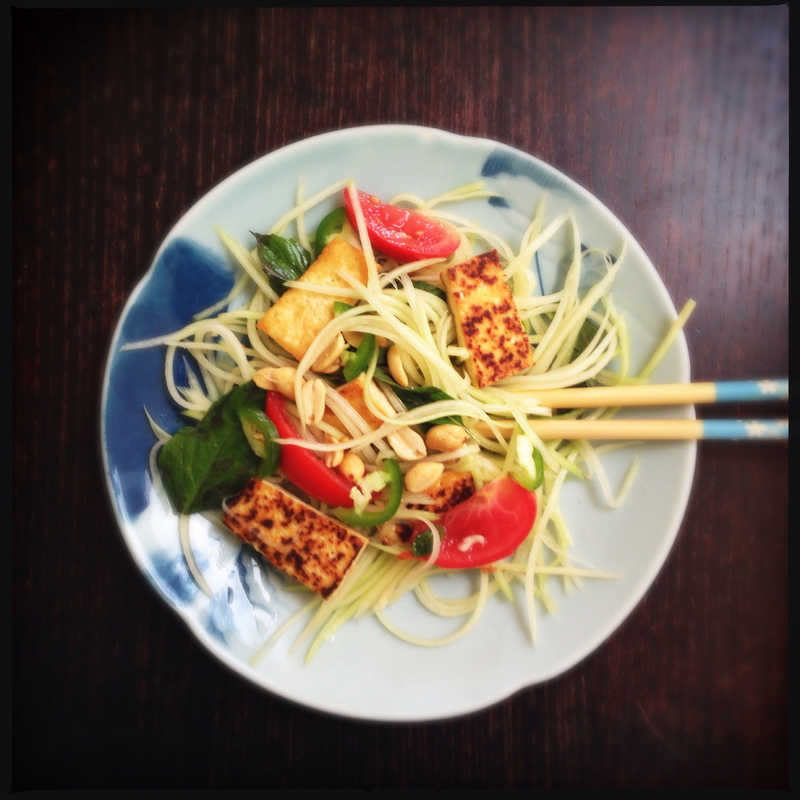 Toss papaya, tofu and dressing with remaining ingredients and plate, ensuring that each serving gets plenty of tofu, tomato and peanuts (they tend to conglomerate at the bottom of the salad bowl). While i love their tentacle look, those chips terrify me! That salad looks rockin’ though. Green papaya is one of my faves, though I’ve never tried to make it. It’s gotta be about time. One of the best things about keeping chickens is never having to feel (too) guilty about wasting food purchases or other mistakes. That’s a great looking salad. I bought Andy Ricker’s ‘Pok Pok’ last year. I read it, and put it away. Too intimidating. You’d think that I have everything here in Chicago, but actually a lot of the ethnic markets here are way out in the suburbs and traffic usually makes it impossible to get to them. I do have one Korean market very near my house. I, however, have definitely wanted to try the green papaya salad and add it to my Pad Thai routine. It sounds absolutely delicious. I see you didn’t use the traditional dried shrimp that are usually pounded into the dressing. Any reason? No particular reason for leaving out the dried shrimp. Actually, a lot of recipes don’t include dried shrimp (Charles Phan’s from the Slanted Door in SF, for example, which does a lovely version). If you’re already using fish sauce, I’m not sure how much you gain from dried shrimp other than a weird textural addition. What do you think ethnic means? This is very intriguing. At first glance I thought that it was noodles and was interested to see that it was actually the papaya. How very creative and refreshing! Quite tasty! It would be impossible to eat if it wasn’t shredded.